Midway through the 18th century, sonnet composer Marquis Giovanni Maria Baldinucci. 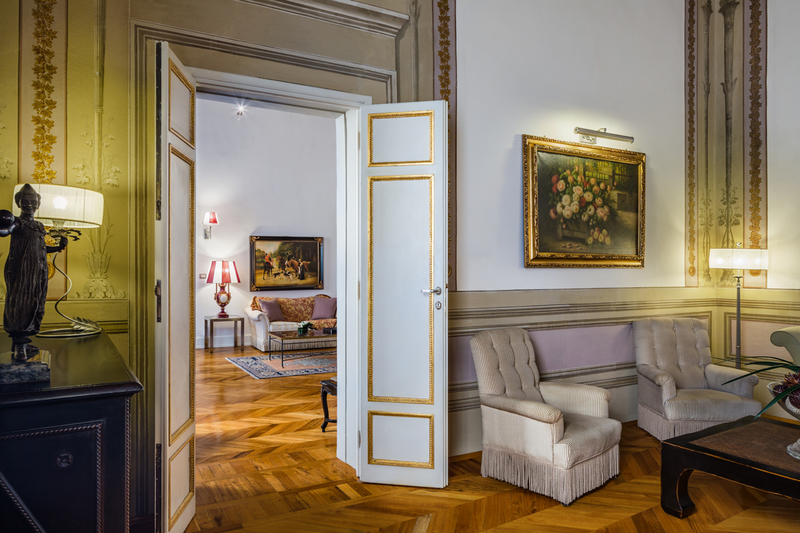 He is a relative of Filippo Baldinucci, who founded the first nucleus of the Uffizi’s Design Gallery, commissioned the building of the sumptuous Palazzo that now hosts the Relais Santa Croce in Via Ghibellina, on a plot of land that had once belonged to Giovanni da Verrazzano. The columns framing the entrance portal were brought from Rome, and a vast hall on the main floor was designed as a concert hall, a small “Wundertheater.” The musicians were hidden behind panels painted with historical scenes, to create the illusion that the music was self-generated, and filled the hall magically. Literati, scientists and artists have lived and worked in the rooms of Palazzo Ciofi-Jacometti over the centuries. The spirit of those times and the beauty of those rooms have remained intact. 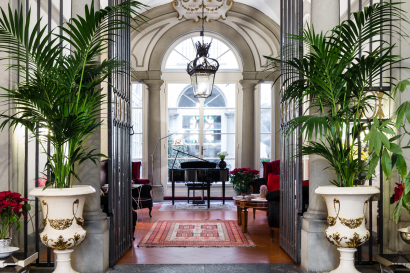 The austere façade, the entrance portal, the wide stone staircase, the halls, the parlors, the drawing rooms, the frescoes and the inlays are exactly as they once were. Ongoing soft refurbishment and full restoration of frescoes in 2004. 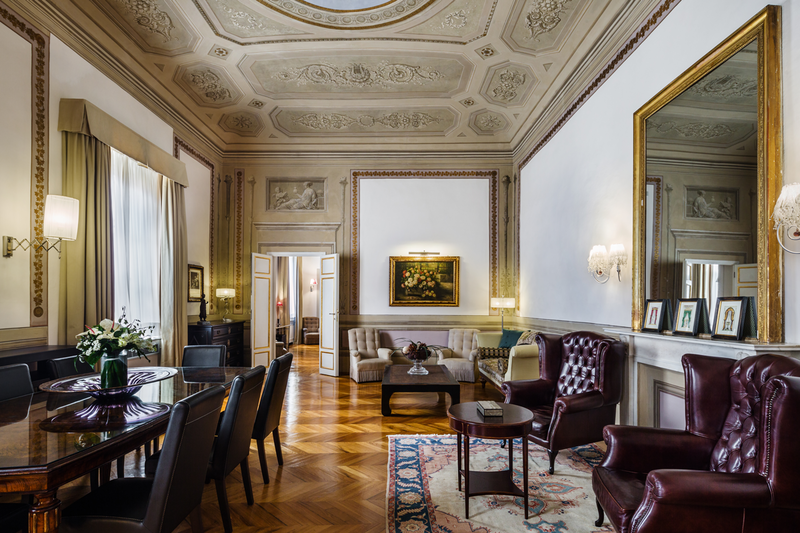 Stunning 18th century Palazzo once owned by the Marquis Baldinucci, treasurer of the Pope. 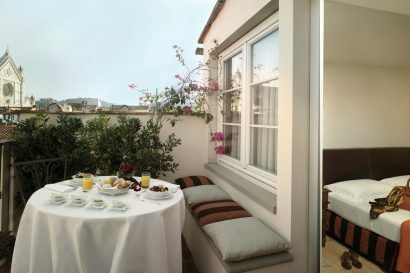 24 rooms and suites with enchanting views over the rooftops of Florence, the Duomo or the Santa Croce Basilica. Exclusive 260 sqm Santa Croce Royal Suite, one of the largest and prestigious suite of the city, with original architectural elements, precious fabrics, period furniture and frescos, for a genuine experience of Florence nobility. 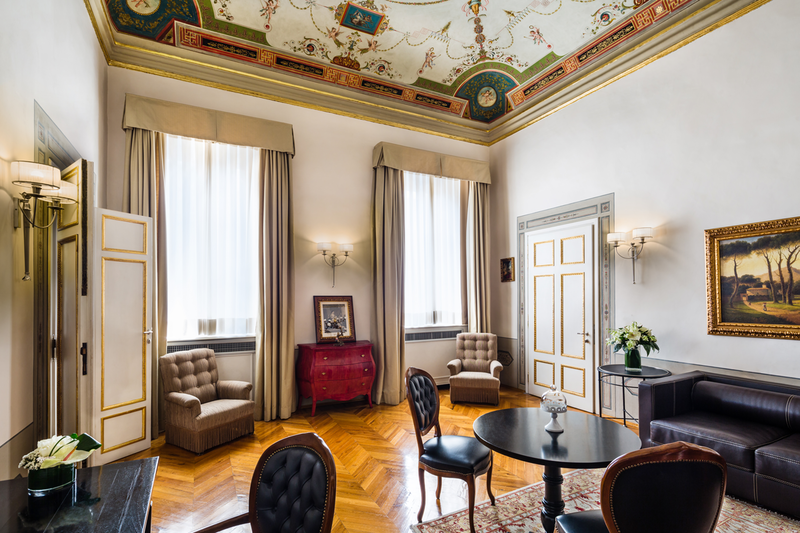 Charming Music Room, with a small stage still used today for musical events or entertainment shows. Frescoed Guelfi & Ghibellini Restaurant, offering authentic regional cooking. 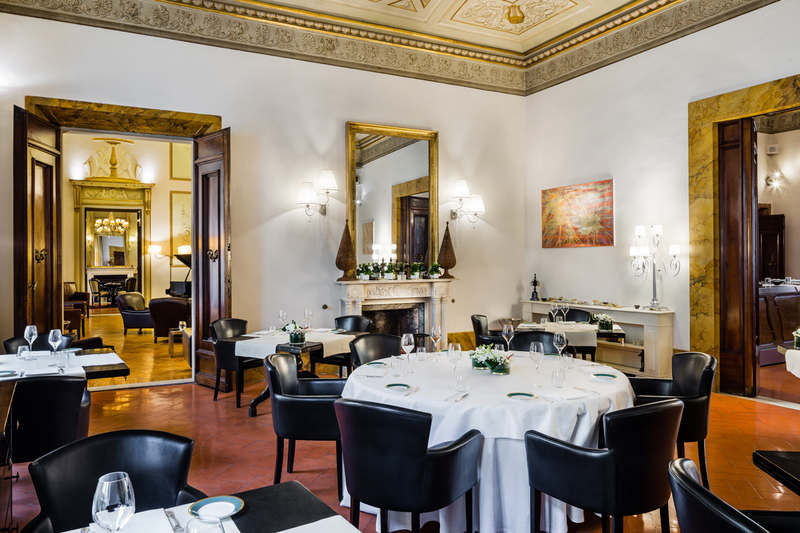 In the same Palazzo is located the three Michelin star Enoteca Pinchiorri, with its fine cuisine and world-renowned wine cellar. 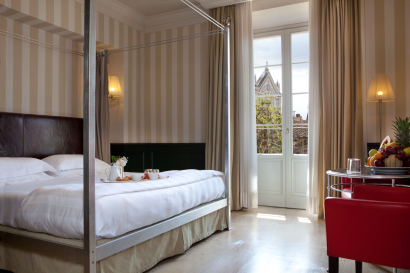 • Downtown and just few steps away from Basilica of Santa Croce. • Piazza della Signoria with Uffizi Gallery, as well as the Dome are 5min walking distance. 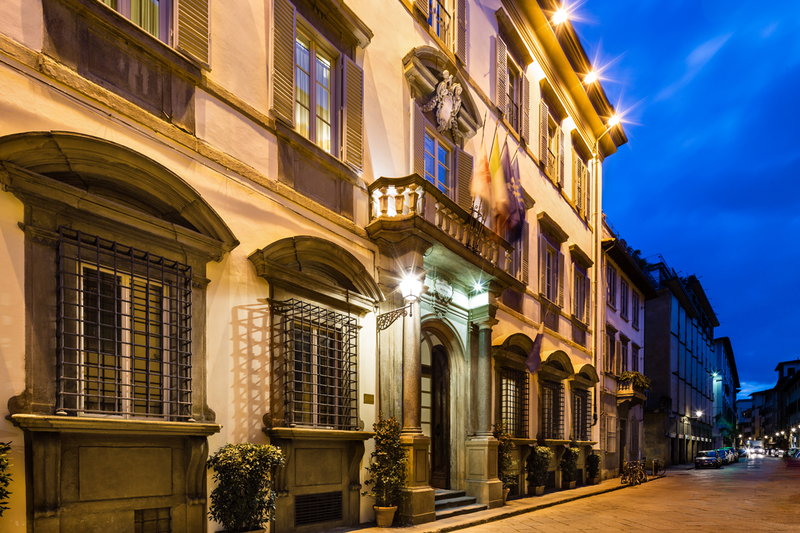 The most famous museums and the most precious monuments of Florence are just few steps from the Relais Santa Croce: Basilica Santa Croce, Piazza della Signoria, Uffizi Gallery, Palazzo Vecchio, Ponte Vecchio, the Dome Santa Maria del Fiore with Baptistry and the Giotto Bell tower as well as the typical artisans craft workshops. 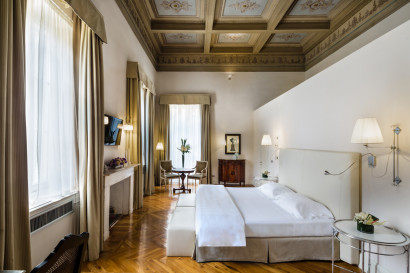 The hotel boasts historic wooden trusses based on a Leonardo da Vinci design that supported a stunning 3-metre chandelier in the centre of the Sala della Musica, the main hotel lounge. 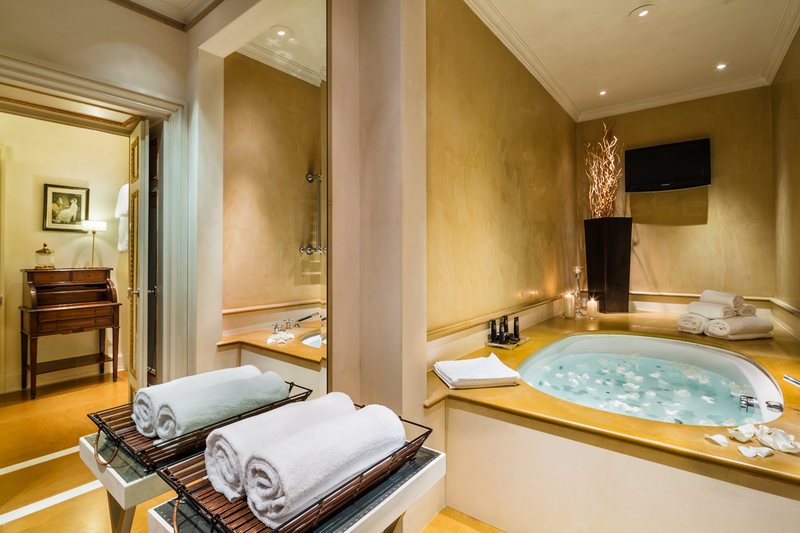 Baglioni Hotels welcomes families travelling with children, with a dedicated program and ad hoc packages. 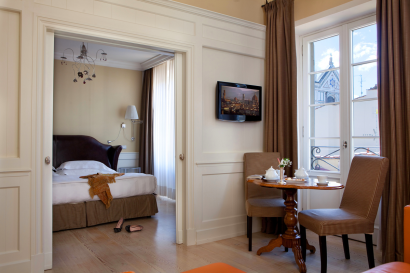 Advantages of the family program include free extra bed for one child (up to the age of 16; maximum 1 bed per room), connecting rooms or family suites, home-made cakes or fruit to welcome you to your room, children’s menu, babysitting service, gift for the family and a selection of cultural or entertainment tours in the city and its surrounding areas (the tours may be personalized and quoted according to requirement). 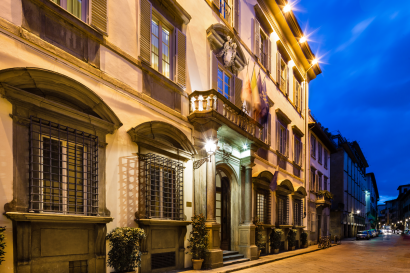 The Guelfi & Ghibellini restaurant excels in Mediterranean cuisine with a strong emphasis on Tuscan flavours; a perfect way to experience traditional local specialties and contemporary variations. The three Michelin star Enoteca Pinchiorri, in the same Palazzo, rounds off the gastronomic experience with its fine cuisine and world-renowned wine cellar. 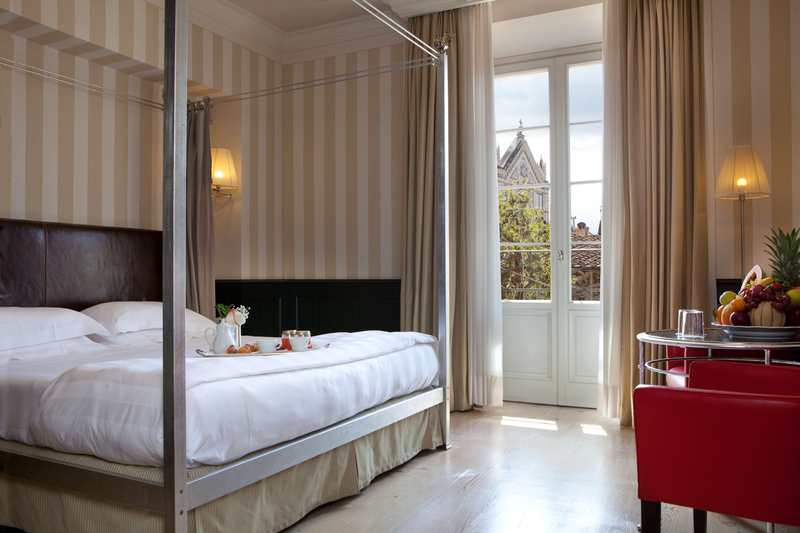 Relais Santa Croce has functions rooms for meetings and events for up to 150 people that combine old-world luxury and contemporary comfort. With its evocative and versatile venues, it is the perfect choice for fairy-tale weddings, private parties, business meetings, conferences and prestigious corporate events. 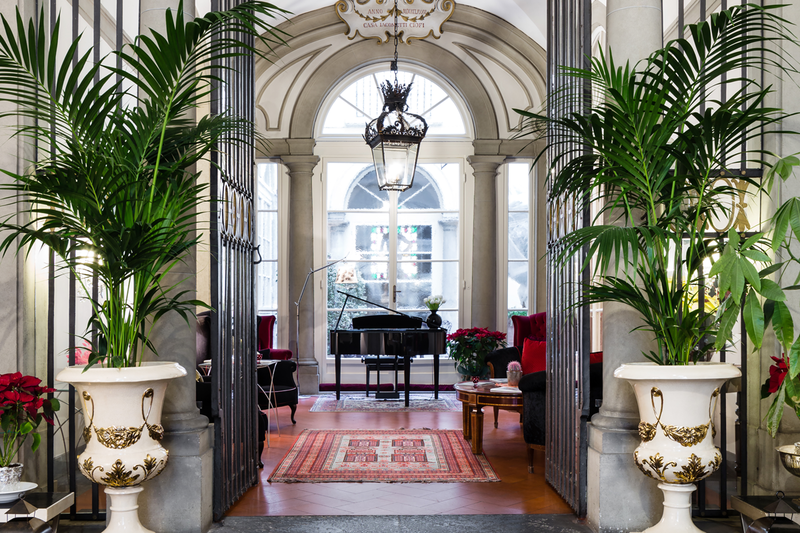 The Palazzo can be hired for exclusive stylish private parties, meetings and promotional events with total privacy guaranteed. Our friendly and attentive staff will be happy to treat you and your guests to the highest levels of service to create a memorable event! Our Concierge is at disposal to arrange any outdoor activities in town, from a visit to the local market to live Florence like a local followed by a cooking lesson, to exclusive signature experiences to discover the city in a unique way. 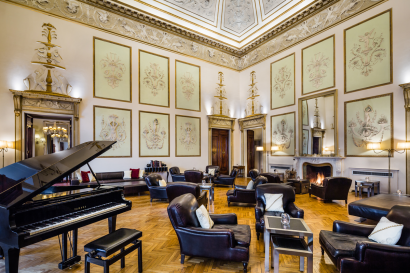 Signature experiences include Luxury Wine Tastings with Princess Gucciardini Strozzi in her unique domain and vineyards and dedicated workshops in partnership with the world-renowned Florentine Leather School.